A postcard being sent out in Alabama by the pro-gun lobby doesn’t endorse or mention the GOP candidate. The Alabama Senate race has become a minefield for Republicans, dividing GOP senators who denounced Republican candidate and alleged child molester Roy Moore from the Republican National Committee and President Donald Trump, who are backing Moore. And the NRA, perhaps the biggest outside political player on the right, has quietly entered the race to help Moore. The NRA’s website does not list the Alabama Senate race as a contest in which it is involved, but two days ago, the Center for Public Integrity reported that the NRA was spending $55,000 to send out postcards to boost Moore in the election this Tuesday. 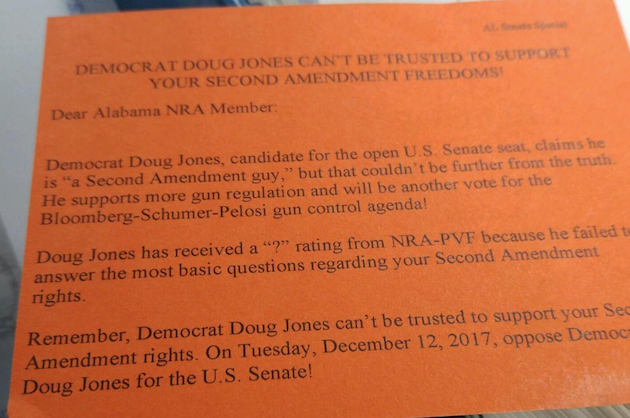 Mother Jones has obtained a photo of the postcard the NRA is mailing to its Alabama members. The mailer slams Doug Jones, the Democratic candidate, and does not make a single reference to Moore. The mailer does not endorse Moore. It does not mention Moore. It is entirely focused on slamming Jones. Perhaps the NRA just couldn’t bring itself to endorse a candidate accused of committing crimes against children. But that has not stopped the gun group from trying to get that man into the United States Senate.